In conjunction with our COLORFUL Vendor Party happening at our Phoenix bridal store today, the Brilliant Bridal team will be sharing some of their favorite trends in wedding colors. We will have three blog posts through out the day as well as inspiration boards shared through Pinterest, Instagram, Facebook and Twitter. Pick your social media site of choice and we'll see ya there! And if you want to join us in person we'd love to have you. Find info and directions on our website. Melanie's board is inspired by a recent friend's Malibu beach wedding. All of the different shades of blue from the sky above to the ocean below create the perfect palatte for any wedding regarless of location. Her board includes some of her favorite wedding trends like signature drinks, a geometric wedding cake design, DIY inspired wedding table settings and an anchor inspired wedding invitation. 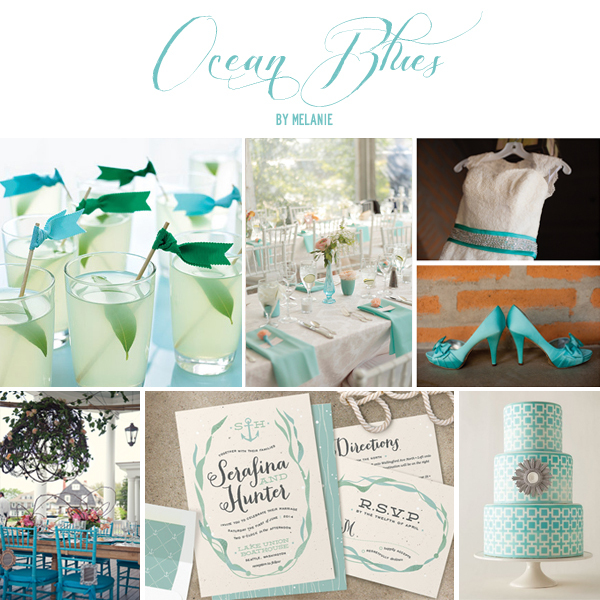 Re-Pin this board for your blue or beach themed wedding. Melissa has been crushing on all shades of green this year and chose shades of the bright and summery lime for her wedding inspiration board. The groom gets a shout out on Melissa's board with a perfect tie and boutounniere combo. Also included is an eclectic bridal bouquet, a lime and grey save-the-date, and the best bang for your buck in wedding decor - lime green paper lanterns. This fun color is complementary to all skin tones and works for any season of the year. Save this board if you're going green for your big day! Don't forget - we'd love you to join us in person today at our COLORFUL vendor party. Get info and directions to our Metro Phoenix bridal store on our Facebook page.